You have liquid creatine, creatine candy, creatine gum, creatine capsules, and even stomach-bloating effervescent creatine (Give this a try, I guarantee you'll only do it once!). With all these "tricks" thrown at trying to market and sell a "different" creatine – very little has actually enhanced or improved upon the effects of regular creatine monohydrate. The problem is, companies are trying too hard to make their creatine different instead of creating a creatine that is actually better. 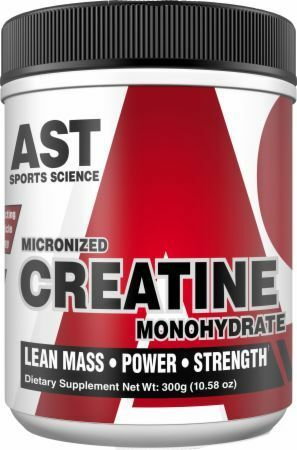 As you may or may not know, creatine monohydrate will not fully dissolve once placed in liquid. That's why you always get that gritty sand at the bottom of the glass. Think about it this way, if it falls like sand to the bottom of your glass what does it do once inside your stomach? Maybe this is the reason why so many complain of stomach discomfort when taking regular creatine monohydrate. With AST's constant commitment to enhance the effectiveness of sports supplementation we have developed a new creatine supplement that includes state-of-the-art particle micronizing technology (PMT). This technology sets a new standard for creatine monohydrate supplementation by actually creating creatine 'micro-particles' that are 20 times smaller than regular creatine powder. Micronizing creatine generates a more pure creatine. By boosting the total processing steps and purification procedures, AST's Micronized Creatine yields a finished product substantially more pure. Test it. We challenge you. Regular creatine monohydrate lingers in the gut longer. This causes uneasiness to many users. AST's Micronized Creatine goes into solution better and exits the gut faster causing no stomach upset.